A 2-hour 360 starts with ... wow, can you guess? And I should post a WARNING right here and now: anyone who is NOT sick to death of all the Michael Jackson coverage already probably does not want to read my comments. Just look at the pretty, play the clips, and skip the rest. Because I hit saturation several days ago, so tonight was absolute hell for me to watch and the only reason I did not start drinking heavily about 45 minutes in was because I was so angry I thought that imbibing flammable liquid might cause some sort of combustion. Anderson talks to Murray's lawyer ... and does ask the question about CPR. Of course, the lawyer says just what you think the lawyer would say. Murray is not board-certified ... doesn't this sound like the guy who killed Kanye West's mother? 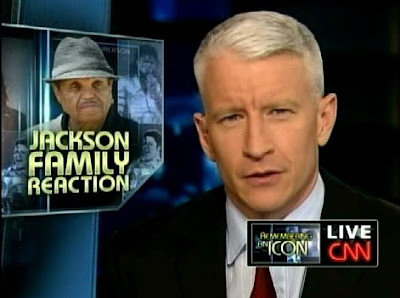 Don Lemon reports on Joe Jackson's weird comments at the BET awards. And Janet's weren't much better -- to the public Michael was an icon, to his family he was family? Uh... yeah. Kinda obvious, there. Al Sharpton, who can be counted on to push himself front and center of any situation involving an African-American, is on next. Does anyone care what his opinion is about this? He doesn't even grasp the issue about Joe's comments. I do not understand why we are listening to him. Erica Hill does the first 360 Bulletin: Iraq marks US pullback (and they'd best spend some more time on this tonight!!! ); Iran recount complete; white firefighters win Supreme Court appeal, overturning Sotomayor's ruling; Governor Sanford's mistress speaks out and says her computer was hacked to get those salacious emails. 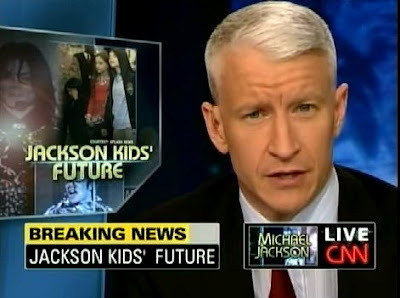 Anderson says Michael Ware will be on later, and I rethink slashing my wrists since there is now some hope of non-MJ news tonight! Erica updates the questions about who may get custody of the kids. I appreciate all the difficulties that Jackson went through, and Chopra is very compassionate -- but I have to ask, at what point do you say, whatever I went through as a child, I am now an adult and must accept responsibility for myself? There are children who were sexually abused, who witnessed true horrors (not over-pampered showbiz childhoods), who faced every kind of nightmare imaginable... and they pull themselves together without having anywhere near the kind of resources he did. I'm not saying he didn't have issues, and certainly he had more than enough enablers around him... but seriously. Anderson next talks to Tom Mesereau, who defended Jackson in the child-molestation charges. Wow. It's no wonder that Jackson remained child-like with people like this around him. Dude, he wasn't Gandhi. Oh, thank god... we're going to talk about Bernie Madoff next. Jeffrey Toobin joins Anderson. 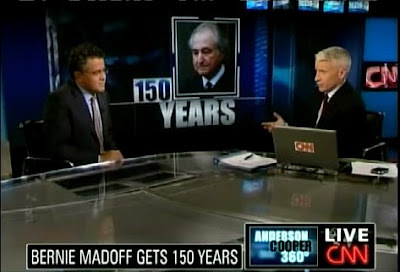 Madoff gets 150 years. His "apology" sounded like someone talking about a car accident: "I didn't mean for my car to skid on the ice and kill those people, and I will have to live with that for the rest of my life." Bernie, you knew damned well what you were doing. They also talk about today's SC ruling about the white firefighters whose promotion test was voided and what might happen if MJ really didn't leave a will. 2nd hour starts with Drew's report again. Then Anderson speaks with Lou Ferrigno, who was a long-time friend and trainer. He didn't see signs of fraility nor drug use. Gary Tuchman takes a look at the financial mess swirling around Jackson. Oh, jeeze, they're gonna talk about his purchase of the Beatles rights as "shrewd"? Yeah, tell that to Paul McCartney. 360 Bulletin #3; Madoff sentenced; Supreme Court ruling re white firefighters; beef recall; how old is old? Replay of the Chopra interview. Tom Foreman looks at Jackson's physical changes. Marcus Mabry talks to Anderson about race. Iran confirmed the election results. (Big shock.) Reza Sayah is on from Atlanta. 360 Bulletin #4: Billy Mays autopsy; Hondouras military coup; gay-rights reception; ugly-dogs. Okay, I'm heading to the bar now. 360 has gone way overboard with this Michael Jackson Coverage. Even E! and MTV have moved on and don't talk about it 24/7. It is ridiculous. There is so much going on in the world and yet 360 continues to talk about Micheal Jackson. And why is it that the only time we ever it two hours of 360 is for something stupid. Never for real news do we get two hours. The best part of the show was the interviews with Reza Sayah and Micheal Ware, naturally they were in the second hour and during the last 20 minutes of the program. I really hope 360 is better tonite but I won't hold my breath. They've gone down the Anna Nicole road and there's no turning back now. Can't wait to see Anderson on R&K! I always like when he is on there. I'm with you. Now the coverage of MJ reminds me of the oversaturation when Anna Nicole Smith died. Most of these stories are not news but speculations. It's not going to end until maybe the results of the toxicology tests come out but that may only lead into more speculatiive comments. He was a big star but unfortunately the news outlets are feasting on all things Michael. I also fail to understand Al Sharpton's role in this and why media must always put a mic in his face. My local news station found someone who was in a 1983 video with him to interview, the same station promised to come up with someone who was on his tour bus. Have the major/cable news media gone and lost their minds? Thank goodness the first coverage of the Iranian Revolution didn't compete with this. I think the those in the news business would surely not know what to do. "Al Sharpton, who can be counted on to push himself front and center of any situation involving an African-American, is on next." As an African American young woman--ROTFLMAO! It's so true. I wonder how he sustains a living, clearly does not have a 9-5. I love MJ as much as the next person, but there is still drama in Iran that I would like to hear about, and the Iraq news should have been the brunt of the newscast. I can't believe it's been 6 1/2 years that we've been over there. It was just yesterday my high school staged a walk out in protest. I can't believe we're FINALLY LEAVING!!! And the fact that the Iraqi's are so happy that they're making it a national holiday--if that doesn't tell you how they feel about the United States I don't know what will. Cyn, I hope you enjoyed that drink as much as I enjoyed this post. CNN is basking in the great ratings that the MJ coverage has brought them and they probably aren't ready to give that up and slide back into fourth place again, but I do believe they need to dial it back now - the MJ coverage last Thursday and Friday was sufficient and any subsequent reports shouldn't consume the entire program. 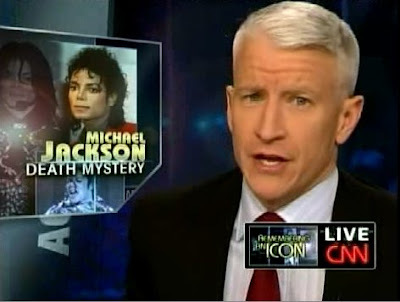 If they can do two hours on MJ, they've got time to fit in that interview with Roxana Saberi, where was it? Hopefully, 360 will not push Iran/Iraq onto the second hour after all the MJ fervour dies down. Michael Ware's reporting was more intense than usual and that's saying something. There's a mountain of upheaval taking place in the world now (Honduras, anyone?) and it's past time for 360and other news programs to get back to what's really important (and I say this as a fan of Michael Jackson's). Oh and btw, Joe Jackson is despicable. Unfortunately, I was sooo exhausted by 11.45 pm, I feel asleep through the show. 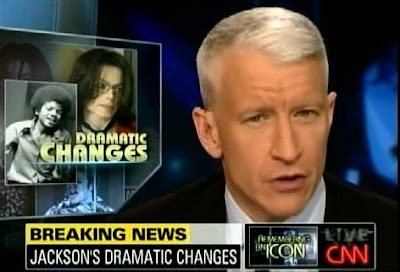 I was actually amazed AC spent almost the entire 1st hour on Michael Jackson, but I guess there are so many issues and items surrounding Michael Jackson and his family, it would take a better part of the program to cover each item. It will certainly be interesting to see how this all plays out and how/If this man’s death will transform any changes with dispensing of Prescription Drugs in North America, as well as what will become of his NeverLand Ranch and his kids. I was so totally unimpressed and very perturbed by Joe Jackson and his behaviour over the past several days. I feel for his loss, but the man seems more interested in promoting his new business venture, versus protecting the legacy of his son, and his son’s children. The interview Anderson conducted with Dr. Chopra and Lou, I found to be rather interesting, especially the interview with Dr. Chopra. It saddens me to no end, when a friendship of twenty plus years, ends up like this. When you have to watch the demise of a friend, despite all your best efforts to impact their life in a positive way, even through the most difficult and tenuous times, you really never want to give up hope, but there is only so much you can take responsibility for someone else’s actions and downfall. What I feel most disheartened about is despite all the fame and fortune in the prime of his life, Michael Jackson seemed to be the loneliest man, despite the millions of fans who loved him. It breaks my heart to see how such people never truly find true peace within themselves, despite the tons of people who are “supposedly meant to be looking out for his best interests”. I truly hope Michael Jackson can find the peace in death that he so desperately searched for throughout his life. @Aries Moon, I agree Joe Jackson is despicable. There's something really wrong with him. Who promotes a record label after their son has just died??? That's just wrong on so many levels. I hope 360 starts putting real news in the first hour. 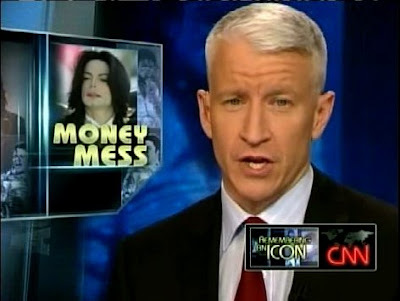 What they need to do is put real news in the 10pm hour and Michael Jackson news in the 11pm hour. I saw a tiny bit of Anderson on R&K and he said that he had to get on a plane in 3 hrs. I wonder if he's going to be on tonight? Oh Cyn, how you and I are on the same wavelength! I actually woke up madder at 360 than I was last night, and let me tell you- I was not happy last night. I could hardly sit thru that crap; in fact I spent most of my time watching No Reservations with Anthony Bourdain who was in Uzbekistan- Uzbekistan! I get more international exposure from a retired chef on the Travel Channel than I do from 360 and CNN. I haven’t been this exasperated at 360 since they went ga-ga over the last OJ trial. I wrote a pretty critical email at that point, and I’m thinking of doing it again. I mean, seriously: there was a COUP in Nicaragua, the hand over of sovereignty in Iraq- including 4 new deaths to add to the more than 4,000 the U.S. has lost, the on-going unrest in Tehran (which I noticed they were patting themselves on the back for their coverage of said events during the commercial breaks), the fragile nature of both Afghanistan and Pakistan, North Korea- doing whatever the hell North Korea does- not to mention domestically we had Bernie Madoff, an economy that still hates most of us, politicians playing tag with their tender bits- and we still get 45 minuets of “breaking news” regarding a single person who died 4 days ago. (New pictures from TMZ! Woo Hoo!) I just saw this morning a promo for 360 tonight featuring a complete report on Joe Jackson and his relationship with Michael. In the words of Jon Stewart, “360 Producers, meet me at camera 2”: What is wrong with you? Do you honestly, feel as if your program last night gave us the most important, relevant news of yesterday? Are you proud of the broadcasts you have been producing of late? Remember back when 360 was cutting edge, spending an entire week covering a famine in Niger that no one else was talking about. Remember saying enough is enough with Natalie Holloway? Remember holding people’s feet to the fire during Katrina? Remember all of the great things that made 360 different from all the other news shows? We, who have been loyal viewers for years remember. And desperately miss the high-standard and compelling reporting that was the hallmark of 360. Please, please take stock of what this show has become, before I completely stop checking in at 10pm- if even briefly. Sure, by chasing stories such as this you might receive a spike in ratings from those who don’t normally watch your show, but you are doing so at the expense of your long-time, loyal viewers, such as myself. Think about that. @Nebraska Fan, he'll probably be on. Kay Jones twitttered last nite that she was on her way out to LA. So my guess is AC will be there as well. Joe Jackson truly scares me. He may live in Vegas, but he always seems to be around when there's a buck to be made. Hopefully the court will appoint the 3 children guardians ad litem to make sure that they are well represented and that their well beings are top priority. And can the Rev Sharpton be more annoying, he just flew back to NYC for the tribute at the Apollo theatre and then plans on going back to LA. The man truly knows how to live off the spotlight of others. According to the AP the coverage is finally waning and hopefully by the time this week is over things will get back to normal. Cyn - While I respect MJ's musical talent and performance abilities -- and the good he did breaking down barriers, etc. I certainly agree with you 2 nights of coverage (last Thurs. & Friday) were quite enough for me. (Time for Larry King to report the rest of the story.) 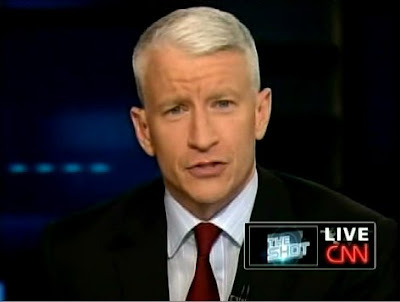 I, too, thought the airplane crash that happened right before Anderson went on air should have been the real "breaking news" - and it wasn't even mentioned! Unfortunately, sounds like AC is going to reporting live from LA tonight, so we can only imagine what the lead story will be. Seems like most of CNN is in LA - ( I have a feeling that AC's cohosting duties on Regis & Kelly today is probably what kept him in NY last night.) With the public memorial slated for Friday -- and a private burial on Sunday -- my guess is Anderson will be in LA the rest of the week. 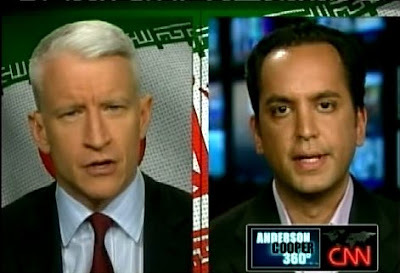 Hopefully with the burial on Sunday, CNN and the producers of AC360 (not sure how much say Anderson has in this matter) will turn their attention to what's happening in the rest of the world -- and believe me there's plenty to report on. It was originally posted that the Roxana Saberi interview would air last night, but MJ seems to have trumped that once again. I loved Michael Ware's report last night and the way he stopped Anderson's questioning to report on the "moment" happening in Iraq. How sad that this wasn't the lead story and MJ moved to the 2nd hour. Anderson on Regis & Kelly this morning was pretty funny when he was spraying whipped cream directly into his mouth during one of the segments. Like to see this "lighter" side of him. Thanks, Cyn for the post -- hope you enjoyed the drink last night. Someone game me a bottle of wine yesterday -- I might open it tonight if the lead story is MJ! Cyn, I echo your sentiments exactly. When I started watching the show, I thought maybe we'd get 10-15 minutes on MJ and then move on. After 30 minutes, I was so upset I turned the TV off. I get that MJ dying is a huge deal but there are tons of other things going on the world. Now onto happier things. It was great, as always, seeing AC on R&K. Though there was Michael Jackson talk again, it was only a few minutes which is fine. I loved hearing more of Anderson's stories about Studio 54. Just like the post from a couple of days ago said, he sure has led an interesting life. P.S. I hope the reason for the LA trip is not more Michael Jackson stories. 360 is usually good when Anderson is in LA so here's hoping! I'm glad I conked out last night. My only regret is missing MW. We need to take a break from MJ - call me when the final autopsy results are in. Oh, and the R&K whipped cream moment - sent me straight to the naughty chair LOL! @ACAnderFan, I get sick when Joe Jackson shows up, he's really nuts. I give him his due for getting his sons started in the business, but he's gone off the deep end. Ah jeez, AC in L.A. for MORE MJ coverage? Really? Thank the good lord that I am not blogging tonight. I might need an IV drip of painkillers myself. My friends in LA are trying to figure out how to avoid the procession on Thursday ... gonna make the freeways a mess heading into a holiday weekend. @Cyn -- Glad 360 wasn't 2 hours tonight or I might have thrown my shoe at the TV! Saw 2 or 3 very good Michael Ware interviews earlier in the day -- one was with Ali Velshi when he was covering Rick Snachez's hour. How do I access your site with the clips, once you get them posted? I need real news! !